A new database was launched this week to facilitate navigation through the patent field and increase transparency surrounding the patent status of medicines and licences. 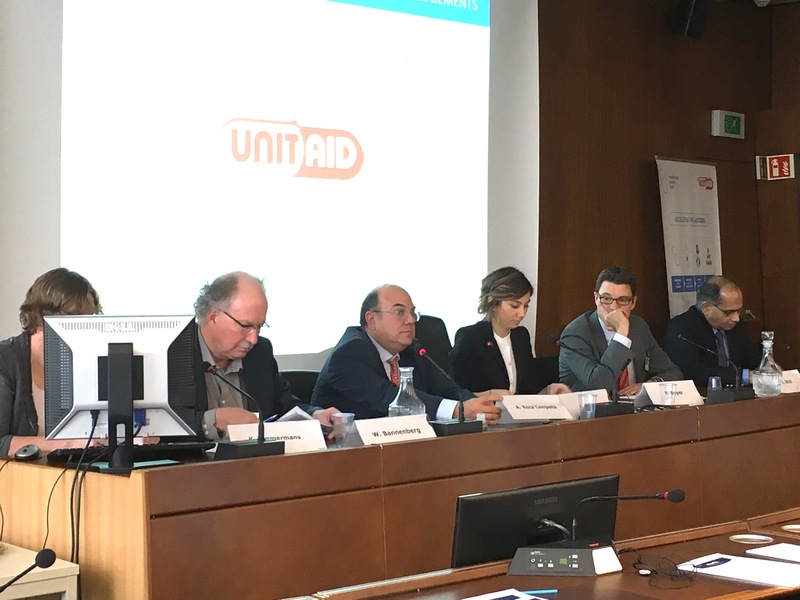 The Medicines Patent Pool (MPP), Chile’s National Institute of Industrial Property (INAPI), and global health initiative UNITAID held a side event at the WIPO General Assemblies on 5 October. The event was held to present “MedsPaL”, the MPP’s Medicines Patent and Licenses Database, discuss the difficulties in navigating the patent field, and report on the activities by regional and national patent offices, which could inform and build on the new database. According to the MPP, the database is a new resource for information on the intellectual property status of priority medicines in developing countries. MedsPaL replaces MPP’s HIV patent status database and will now hold information on 35 patented medicines and more than 100 formulations for the treatment of HIV, hepatitis C and tuberculosis included in World Health Organization guidelines or in its Essential Medicines List. The database also includes data on more than 30 licences to enable competitive manufacturing or supply of these medicines in low and middle income countries (LMICs). MPP’s press release on MedsPaL can be found here. 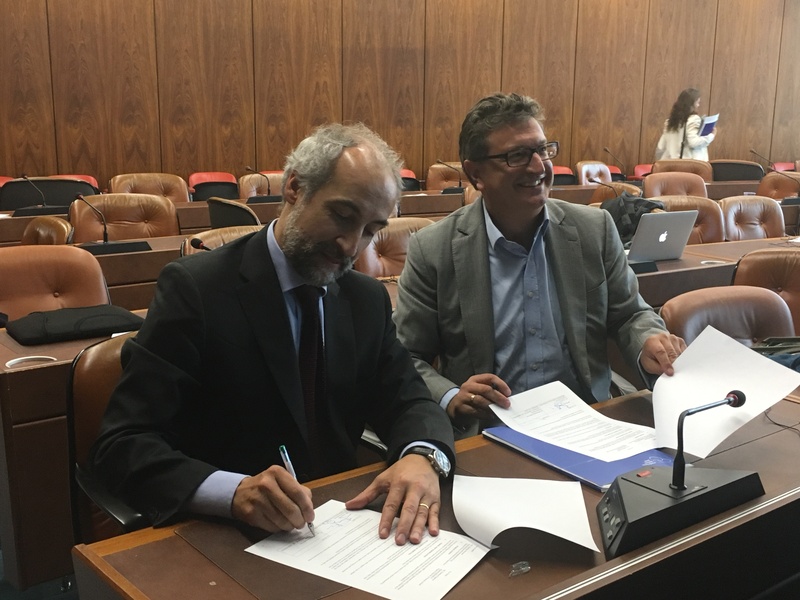 A memorandum of understanding was signed with the European Patent Office (EPO) to further facilitates the automatic downloading of information from the EPO public site (Espacenet) to update MedsPaL regularly. Also in collaboration with INAPI, an annual update of the legal status of a list of about 30 patents is to be put in place. Signing of the cooperative agreement between G. Perry, MPP, and M. Santa Cruz, INAPI, after the side event. 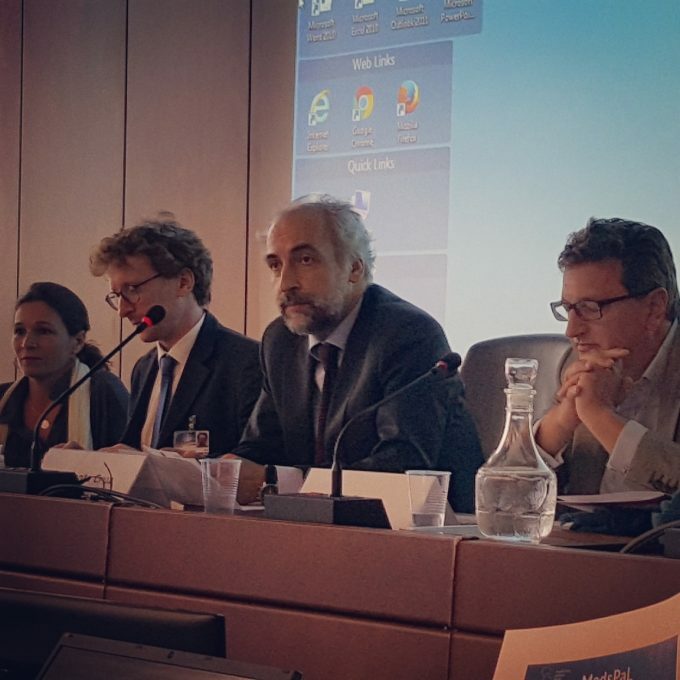 The backdrop of the 3-11 October WIPO General Assemblies presented an opportune setting to address those dealing with IP and information, said Maximiliano Santa Cruz, executive director of INAPI. In his opinion, “governments, especially patent offices, need to take more responsibility in the information that we share with users.” These include not only patent applicants, but also citizens and patients, IGOs, NGOs and the public sector, said Santa Cruz. Greg Perry, executive director of the MPP, said, “Transparency is fundamental to our work and of our objective.” The MPP was established in 2010 with the support of UNITAID and has been involved in licensing new, patented HIV medicines to accelerate the availability of generic versions for use in developing countries. Perry highlighted that work on the database began several years ago, by collecting information on the patent status of HIV medicines in developing countries. Close work was undertaken with WIPO, national patent offices and patent holders themselves to contribute to the project, as well as extensive consultation with many users of MPP’s prior database. Esteban Burrone, head of policy at MPP and Pascale Boulet, patent information consultant, presented MedsPaL, outlining the reasons for its creation and process undertaken, as well as remaining challenges. In negotiating licences, the MPP has to decide which products are needed, firstly from a medical perspective, and secondly, the MPP must identify which products are patented and where, explained Burrone. The latter proving to be quite difficult and in turn, WIPO introduced the MPP to national patent offices to collect data and find the necessary information on patent status. Burrone presented the key features of the new database. These include an increase in disease scope, a single entry point for key IP data such as on patent status, licences and data exclusivity for example, links to specific formulations, and other improved functionalities. Boulet explained that patent status information is obtained by automated data feeds from the EPO’s Espacenet and is supplemented with data collected from WIPO PatentScope, individual patent offices and via local experts as well as patent holder disclosures. With regard to licences featured on MedsPaL, those negotiated by MPP, bilateral licences between originators and generics, commitments not to enforce patents on a given product, and compulsory licences are included on the database, Boulet said. Additional features to come will include the ability to download search results, visualisation of search results via maps and brief search reports on pre-defined queries. Both Burrone and Boulet invited further collaboration with the audience (such as national IP offices) and encouraged national patent offices and other organisations to communicate ideas to MPP to further improve MedsPaL. Practitioners in the field welcomed the new database and noted the importance of transparency and disseminating information regarding patents and licences worldwide. Wilbert Bannenberg, pharmaceutical consultant from IDA Foundation, a nonprofit supplier of essential medicines and medical supplies to low- and middle- income countries, cited the problems facing the supply of generic drugs. Searching for the relevant information is often subject to inefficient and long procedures, with at times conflicting information or information that is non digitalised. In the Q&A, Beyer said it is possible to get data on patents on medicines in Europe, but not easy for many countries. So when the results do not show a patent in those countries it does not mean there is not a patent, just that the data is not there. For instance, he said he participated when a group of intergovernmental organisations gave a workshop in the United Arab Emirates and found that there were some patents on hepatitis C medicines written down in print in the country but not electronically available. To know if they have a patent one would have to go there, he noted. Beyer praised the MPP, calling it “one of the greatest achievements in this area” since the WHO Global Strategy and Plan of Action of several years ago. He said he would support all patented essential medicines on the WHO Essential Medicines List being added. He also raised a question about registrations, saying that to know if a drug can be sold in a particular country it might be necessary to go to every national and legal authority to get information, which can be a barrier even if there is no patent. Finally, in answer to a question, Beyer said he thought a database in biologics would be “doable,” but that it might be more complicated and expensive. Alessia Volpe, coordinator of public policy at the EPO, outlined EPO’s strong commitment to patent transparency and underscored the importance of partnerships with other specialised IGOs and NGOs to expand the reach of patent information to new stakeholders. The EPO collects, digitizes and publishes patent information from over 90 countries worldwide said Volpe. Over 90 million patent documents are in the EPO’s Espacenet database, with an integrated translation tool resulting from a partnership with Google. The tool works in 32 different languages, including Chinese, Japanese, Korean and Russian. Volpe also described the functioning of the Global Dossier which connects the IP5 offices (China, EPO, Japan, South Korea, United States) and gives instant public access to data relating to applications cross-filed at these five offices, saving time and money for users. According to Volpe, public organisations, just like the private sector, can benefit from patent information to support for instance their licensing negotiations. Rajesh Dixit from the Office of the Controller General of Patents, Designs and Trademarks of India, shared the experience of the Indian patent office with managing patent information. Dixit set out that new procedure has been put in place to submit online applications in a move towards “paperless offices” and the 4 patent offices in India were to be integrated electronically. A database with information relating patent applications and registration was available to the public on the Indian patent office’s website in a free and transparent manner said Dixit. Alejandro Roca Campañá, senior director advisor to WIPO’s Global Infrastructure Sector, communicated WIPO’s policy on dissemination of patent information, based on principles such as the modernisation of IP systems, worldwide diffusion of information and the effective use of patent information for technology and scientific advancement. Campañá further described other activities and projects by WIPO, citing in particular its database PatentScope and its extension Chemsearch, which facilitates the search for chemical compounds. "New MedsPaL Database: Enhancing Transparency In The Patent Field" by Intellectual Property Watch is licensed under a Creative Commons Attribution-NonCommercial-ShareAlike 4.0 International License.